Brown Pundits: "Indian Muslims live for India....die for India"
Fine words...no doubt meant sincerely. It is smart politics and smart policy to divide the opposition vote-bank (as the BJP sees it) into Indian Muslims (patriots) and Muslim Indians (splittists). Our opinion remains unchanged: actions speak louder than words (and words need to be spoken with care). Above all we need to put a stop to the polarization for votes aka match-fixing (all parties do it), it is an un-reliable recipe for success (even if it was not such a despicable one to begin with). Everything considered, Toilets before Temples seems to be the best slogan for a secular nation full of young people which looks to the future and stops worrying (but still caring) about the past. Top-line Verdict: Fareed Zakaria is mostly impressed by Narendrabhai Damordas Modi and has a few reservations. FZ describes NDM as "among the sharpest" he has met and that FZ "underestimated him." Also this: "He is very smart, intelligent and focused. He is very driven and has a long term agenda. He wants to be a statesman at the world stage. He is a man who looks to the future and not into the past," the CNN journalist said. 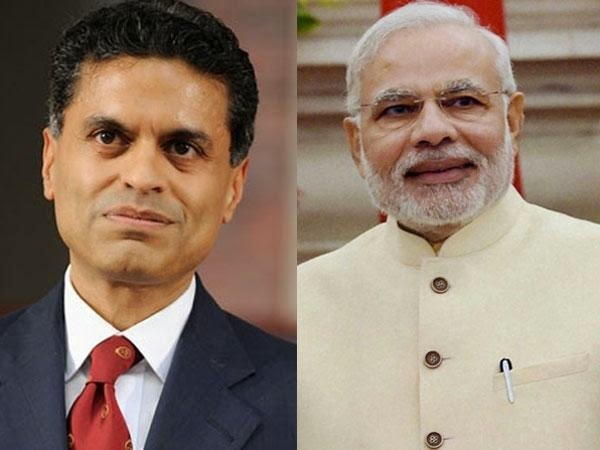 Zakaria said Modi is a deft leader in international affairs and one who is clever to not get embroiled in controversies by projecting himself as a nationalist figure, something his party and its affiliates aspire for. This observation, Zakaria said, was based on his talks with the Indian prime minister. The journalist, however, thought Modi was under-performing in fields of reforms that India needs urgently and apprehended that not a bold Modi but a not-bold-enough Modi could make India suffer. After your election people have begun asking again a question that has been asked many times for the last two decades, which is, will India be the next China? Will India be able to grow at 8 to 9 percent a year consistently, and transform itself and thus transform the world? See, India doesn’t need to become anything else. India must become only India. This is a country that once upon a time was called the golden bird. We’ve fallen from where we were before. But now we have the chance to rise again. If you see the details of the last five or ten centuries, you will see that India and China have grown at similar paces. Their contributions to global GDP have risen in parallel, and fallen in parallel. Today's era once again belongs to Asia. India and China are both growing rapidly, together. But people would still I think wonder can India achieve the kind of 8 and 9 percent growth rates that China has done consistently for 30 years, and India has only done for a short period. It’s my absolute belief that Indians have unlimited talent. I have no doubt about our capabilities. I have a lot of faith in the entrepreneurial nature of our 1.25 billion people. There is a lot of capability. And I have a clear road map to channel it. Ayman al-Zawahiri the head of al Qaeda has issued a video and an appeal trying to create an al Qaeda in India. In South Asia, he says, but the message was really directed towards India. And he says he wants to free Muslims from the oppression they face in Gujarat, in Kashmir. Do you think, do you worry that something like this could succeed? My understanding is that they are doing injustice towards the Muslims of our country. If anyone thinks Indian Muslims will dance to their tune, they are delusional. Indian Muslims will live for India. They will die for India. They will not want anything bad for India. Why do you think it is that there is this remarkable phenomenon that you have a 170 million Muslims, and there seem to be almost no or very few members of Al-Qaeda, even though al Qaeda is in Afghanistan, and of course the many in Pakistan. What is it that has made this community not as susceptible? Firstly, I’m not the authority for doing a psychological and religious analysis on this…But the question is whether or not humanity should be defended in the world? Whether or not believers in humanity should unite? This is a crisis against humanity, not a crisis against one country or one race. So we have to frame this as a fight between humanity and inhumanity. Nothing else. There are many people in the United States, and some in India, who wish that the United States and India were much closer allies – the world’s oldest democracy, the world’s biggest democracy. But somehow that has never happened, and there have always been these frictions and difficulties. Do you think it’s possible for the United States and India to develop a genuinely strategic alliance? I have a one word answer: Yes. And with great confidence I say yes. Let me explain. There are many similarities between India and America. If you look at the last few centuries, two things come to light. America has absorbed people from around the world…and there is an Indian in every part of the world. This characterizes both the societies. Indians and Americans have coexistence in their natural temperament. Now, yes, for sure, there have been ups and downs in our relationship in the last century. But from the end of the 20th century to the first decade of the 21st century, there has been a big change. Our ties have deepened. India and the United States of America are bound together, by history and by culture. These ties will deepen further. So far in your contacts with the Obama administration – you have had several cabinet ministers come here – do you feel that there is a genuine desire from Washington to try to upgrade the relationship with India substantially? Relations between India and America should not be seen within the limits of just Delhi and Washington. It’s a much larger sphere. The good thing is that the mood of both Delhi and Washington is in harmony with this understanding. Both sides have played a role in this.